1 A faux-angora chair paired with a brass table is a perfect spot to enjoy a cocktail while preparing for an evening out. “It adds an element of mystery to the bedroom,” Arazi-Levine says. 2 Simple canvas curtains on rubbed-bronze rods frame the view without overpowering the windows, Arazi-Levine’s favorite feature. 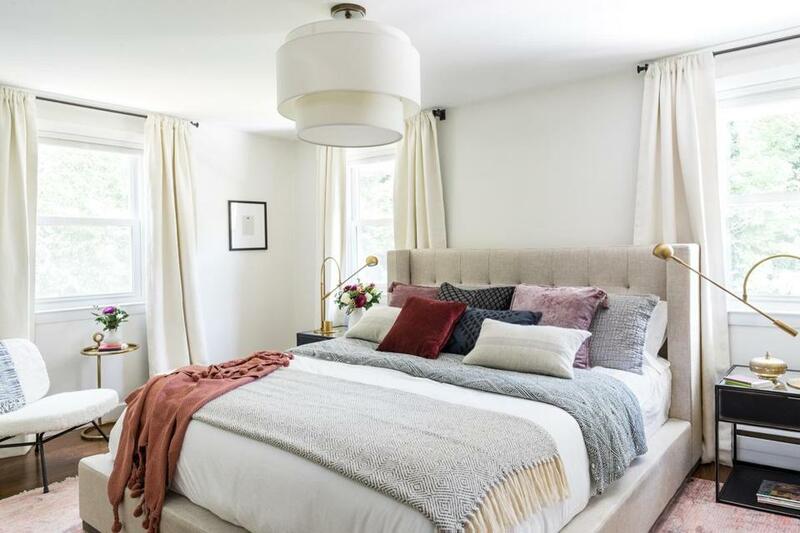 4 Because the king-size bed — a must for the client — takes up a good portion of the space, the designer chose a simple tufted headboard in a neutral shade. “The slight wing detail relays a sense of shelter,” she says. 5 Arazi-Levine appreciates the juxtaposition of the sharp-edged nightstands and the curved forms of the lamps. “They’re like a well-matched couple with different personalities but shared values,” she says.